Piglet sitting on the radiator, a waving grinning grandfather clock, oil-portraits of dogs in military uniform, a motorbike-sidecar-door housing a mirror, a stone horse galloping through the two acres of grounds, a child-size fox dressed ironically in red hunting tunic and breeches. This hotel simply doesn’t do minimalism. Stencilled on the wall there is an answer to the Mad Hatter’s question, “Have I gone mad?” The reply is from Alice as she tries to navigate through Wonderland: “I’m afraid so. You’re entirely Bonkers. But I will tell you a secret. All the best people are.” For the hotel’s guests, it is as if they have bolted down the rabbit hole and emerged in a bonkers but luxurious world. 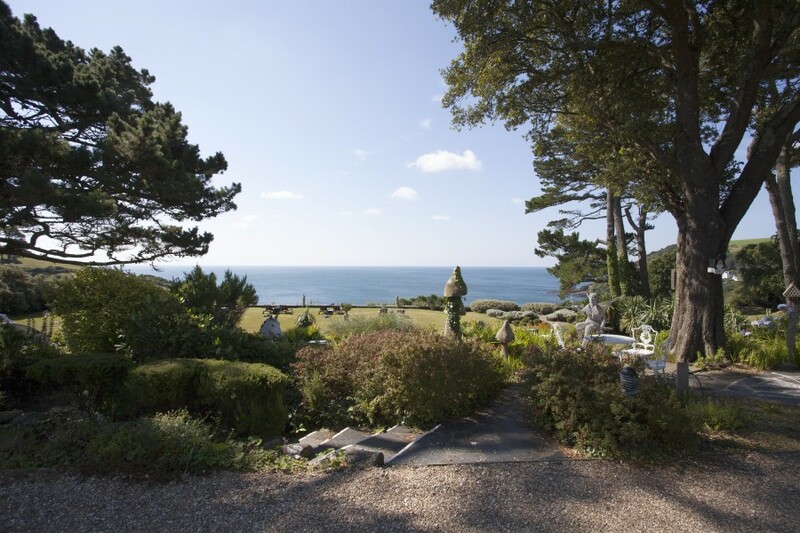 Talland Bay Hotel is hidden away down an ever-narrowing track, scarcely wide enough for a horse-and-cart: which is fair enough as the road meanders through borders, boundaries and hedgerows dating back to medieval times. Mobile-phone reception? No. And therein lies the hotel’s get-away-from-it-all tranquil charm. Though the WiFi’s healthy if you really must reconnect with the frenetic digital world. 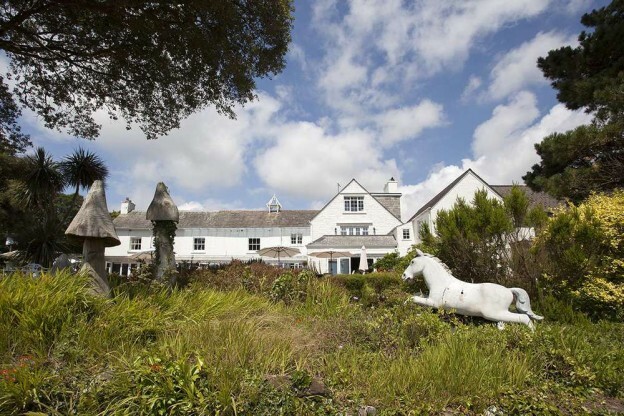 The 16th Century whitewashed house sits discretely on the wave-and-wind carved coast. It’s an extended rambling cottage located on the cliffs between Looe and Polperro. There’s an Italianate feel to the sheltered sub-tropical gardens, with the palm trees enjoying sea views: an echo of the Lost Gardens of Heligan. Round here the past seems to linger on. Paths zig-zag down the cliffs to “Smugglers” coves, maps of wrecks of ships blown onto rocks by relentless winds and they still talk of windsellers: the witchy women who sold prayers for favourable winds to sailors. Most cars race past Talland Bay for Poldark-land and trendy North Cornwall with its art galleries, surf and TV chef restaurants. This 23-room boutique hotel may be a quiet serene place to unwind but it’s big on personality. Zebra-print chic in the lounge immediately sets the tone. Every room is unique. Exuding charisma. No corporate cloned shades of grey here. One room even has a silver sleigh bed. A dressing table may be Queen Anne boudoir, with an Afro-ethnic ebony statuette as its neighbour. And if telephones had been around when Louis XIV built Versailles then surely he would have opted for the very same golden opulent handsets as Talland Bay Hotel. 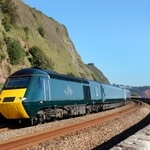 This is the place to read The Salt Path by Raynor Winn, the life-affirming story of her epic 630-mile walk along the South West Coastal Path, with her ailing husband, to ultimately defeat illness, poverty, gnawing hunger and the British weather. Take that salty path east, for an hour-and-a-half of hills and valleys to Looe for Cornish pasty, sandwiches or/and clotted cream teas. Think of the Winns paltry diet of noodles as you tuck into beef or scallops in The Terrace Restaurant. Alternatively, for a flatter, easier stroll of around 40 minutes head west to Polperro. Both Cornish fishing villages with their narrow lanes, seagull soundtrack and cobbles are the sorts of place where you would expect to see old sea-dog Long John Silver doing his shopping. Wallace and Gromit breaks are the hotel’s speciality. Even before you’ve checked in at reception there’s a bowl of doggy treats on offer. “They say that dogs are very welcome and they really mean it,” said one owner, who had driven 6 hours from the Midlands, as his Labrador enjoyed the sausage it was served at breakfast. Guests can dine with their dogs in the Bistro. 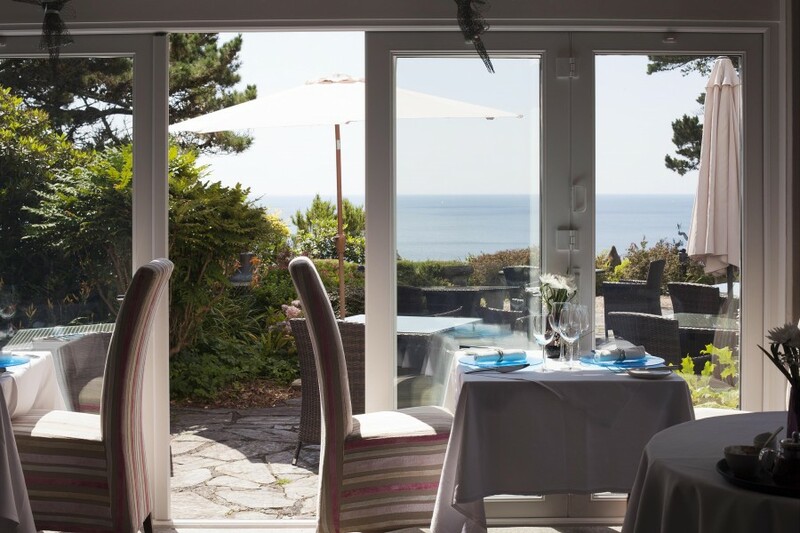 Talland Bay Hotel’s Terrace Restaurant – and the Bistro menu in the conservatory – both draw-in visitors from afar. 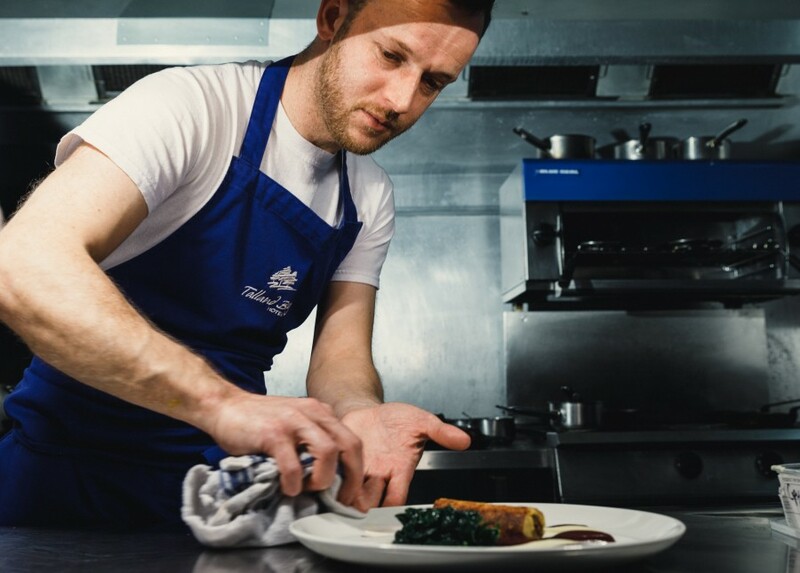 Nick Hawke, a chef who learnt his trade under a Michelin-starred Cornwall chef, aims to make the most of local flavours with locally sourced food: scallops, turbot, skate, moorland beef and lamb are the stars. 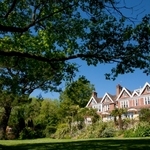 The hotel has only been under new ownership since 2015 and is clearly on a sharp upward trajectory, awarded 2 AA Rosettes for the Restaurant and scooping the title of Best South West Restaurant. You feel that chef Nick Hawke is well on his way to guiding his restaurant to a third Rosette. 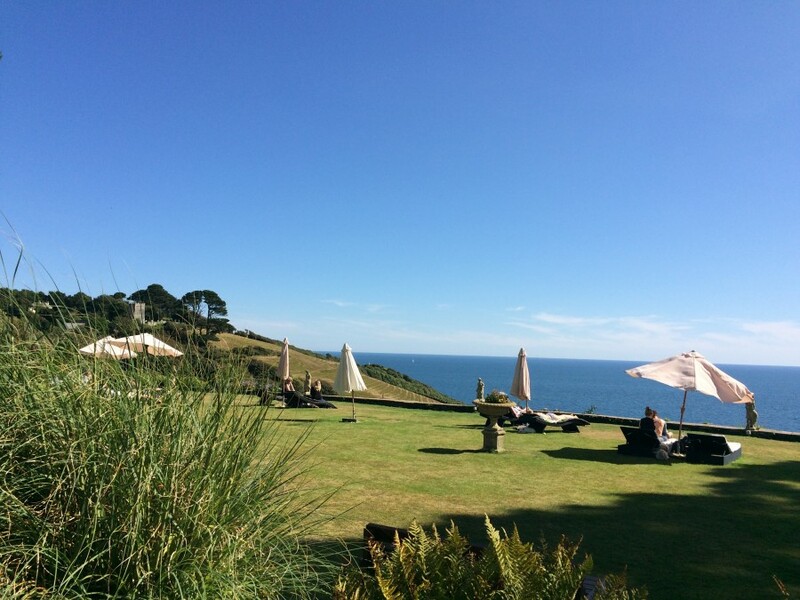 Talland Bay Hotel is definitely one for your “Must visit immediately” list. 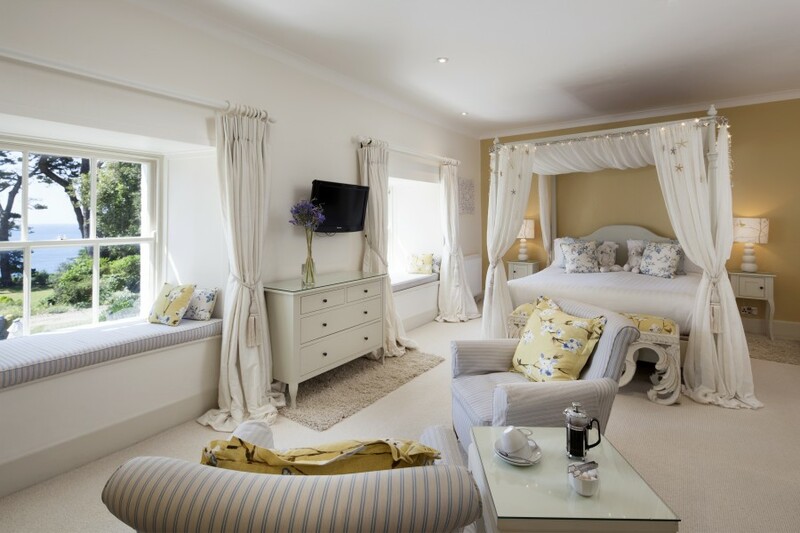 Double rooms begin from around £160 per night (low season) including breakfast, contact the hotel for special Spring deals, Wallace and Gromit breaks and other packages.